How many steps do you do a day? 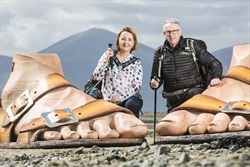 We share our top tips for increasing your steps this summer, info on summer walking events and an opportunity to win £150 to spend on walking gear from Sperrin Outdoors. Fitness Trackers, Geocaching, walking festivals and more. 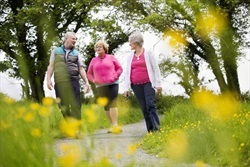 With so many health benefits and fantastic walks to discover, there really is no better time to get out for a walk. Check out our latest blog as we reveal our 'Top Tips For Increasing Your Steps In 2018'. Explore Ards & North Down this Summer through a unique series of walking tours, which allow you to experience some of the wonderful sights and attractions the area has to offer. 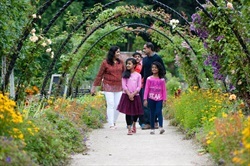 This popular guided tour provides an insight into the garden's history, its restoration and the vast array of plants, fruits and vegetables which are grown there. Explore the botanicals! 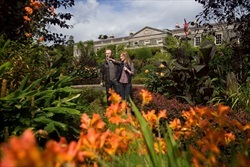 A guided walk through the beautiful gardens at Mount Stewart followed by a visit to Echlinville Distillery to experience the fine art of gin making. Over 18s only. 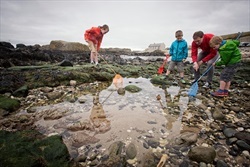 Join local naturalist "Woody" on a beach combing adventure to uncover the numerous types of sea creatures who live on the shores of the park. Trace the steps of Canons, Priests and Pilgrims on a tour exploring the Christian Heritage of Bangor. Winner of the 2017 WalkNI Award for 'Favourite Walking Festival / Event', this internationally recognised festival will feature a range of routes carefully planned to impress at both low and higher levels. The walking festival also features a variety of self-guided lowland and mountain climbs ranging in distance from 10-40km. Known for its lively social scene, those still keen to stay on their feet can enjoy a buffet and dancing during the 'Life & Sole Swing' event. 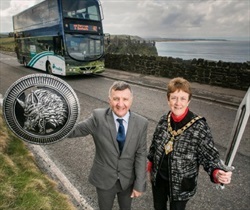 Translink has announced that visitors, including walkers and Game of Thrones fans, will be able to explore the Causeway Coast, with a new extended £8 adult day ticket. The Causeway Rambler ticket is for use on the hop-on, hop-off Ulsterbus service from Coleraine to Ballycastle - a convenient route to all the main attractions such as The Giant’s Causeway, Bushmills Distillery and Carrick-A-Rede Rope Bridge and Dunluce Castle. The ideal shuttle service for those exploring the 33 mile Causeway Coast Way. Note to mountain users on lower eastern slopes of Slieve Donard. A pair of Buzzards are nesting near the lesser used paths leading south out of Donard Park, near the Granite Trail. Accordingly, please take care in that vicinity and spread the word to others to do so. Birds of prey will typically 'alarm call' at any perceived threat that comes too close to the nest site and it is only on rarer occasions that they may dive if the threat persists. We suggest that people stay clear of known nesting areas where possible until the breeding season is over, typically around the end of July. Have you entered our competition to be included in a draw to win a £150 voucher to spend on walking gear from Sperrin Outdoors? The competition closes on Thursday 31st June 2018. For your chance to win this fantastic prize simply fill out the form on WalkNI's Competition Page. Sperrin Outdoors sell a range of apparel and accessories for outdoor pursuits, stocking popular brands including; Jack Wolfskin Clothing, Craghopper, Vango and Highlander Clothing. WalkNI is supported by Causeway Coast and Glens Borough Council, Newry, Mourne & Down District Council, Belfast City Council, Fermanagh & Omagh District Council, Mid Ulster District Council and North Down & Ards Borough Council.